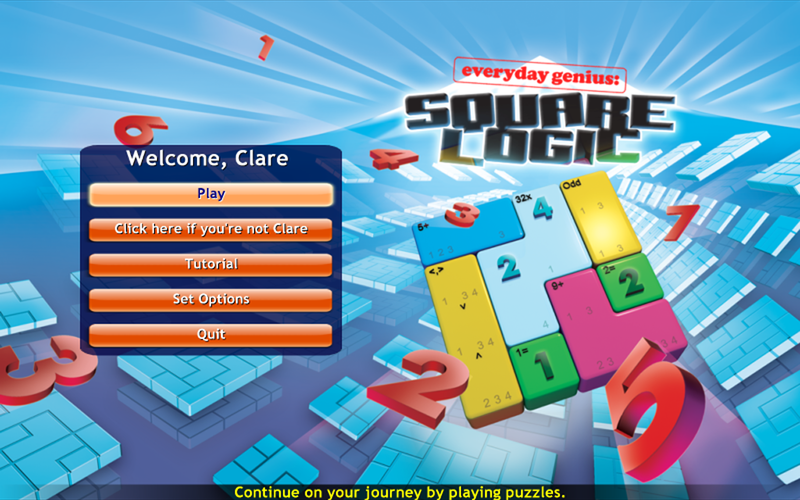 Welcome to the official homepage of Everyday Genius: SquareLogic! 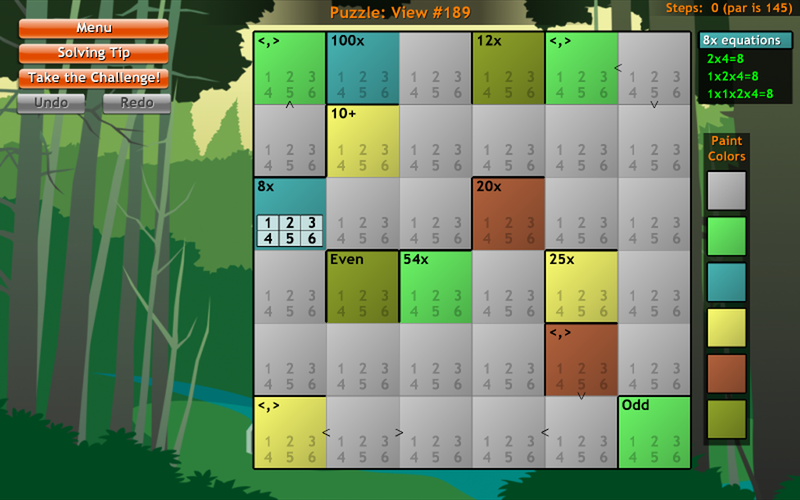 Everyday Genius: SquareLogic is a logic-based puzzle game involving colored cages and numbers. The game includes over 20,000 puzzles in 18 different styles, ranging from first-grade easy to astrophysicist hard. 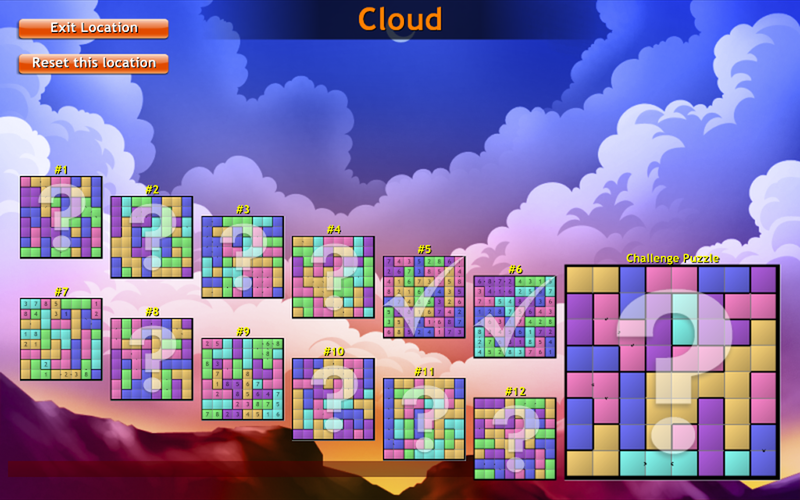 With over 5,000 hours of gameplay, SquareLogic is one of the largest puzzle games ever produced, and with advanced puzzles that take hundreds of moves to solve, it is also one of the deepest. Once you get hooked, it'll knock yer socks off - we promise*. 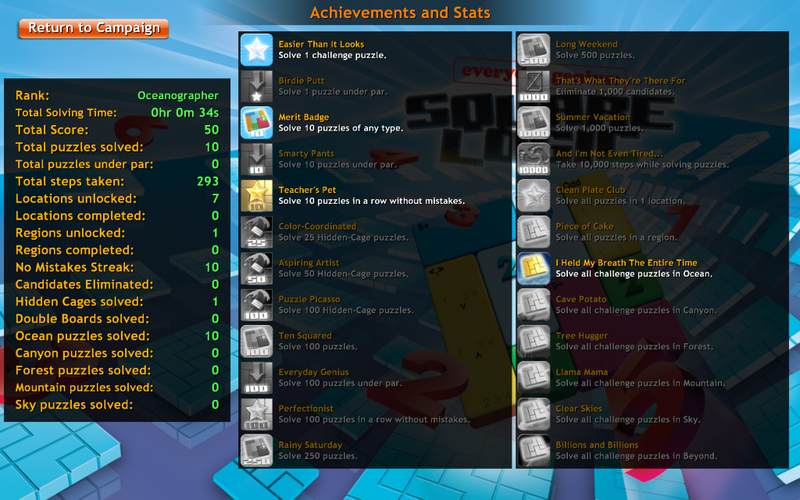 SquareLogic is designed and developed by TrueThought, and published by MumboJumbo. 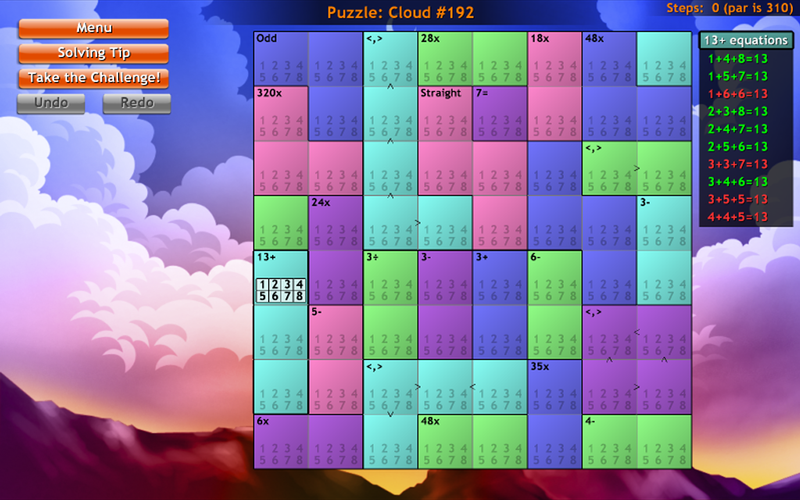 "the next generation of puzzle games"
"a very addictive puzzler that will make you use your brain to win"
"well worth your gaming dollars"
For its initial launch, SquareLogic requires Windows (XP, Vista, or Windows 7) to run. Look for the game to appear on other platforms (iPhone, Mac, and others) in the near future! Show your support by joining the SquareLogic group on Facebook. Help us get the word out! SquareLogic is similar to number-based logic games such as Sudoku, but you'd best buckle up 'cause this ain't your daddy's Sudoku. 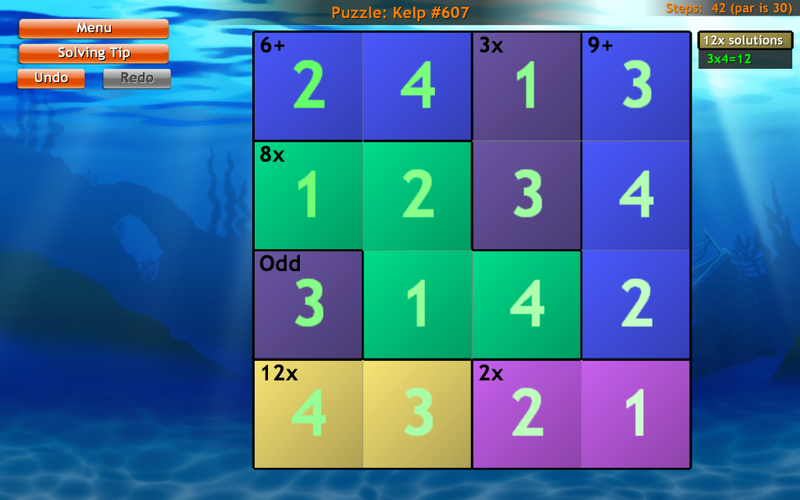 Your goal is to solve the puzzle by filling each square in the board with a number. No number can appear twice in the same row or column. Each board is divided into differently-colored "cages". 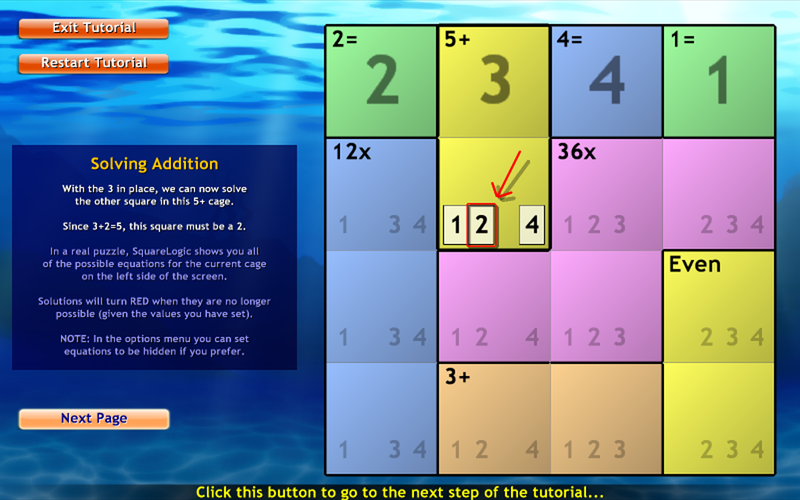 Each cage shows a "rule" in the top-left corner (such as 9+, 12x, or Odd). A rule of 9+ means the squares in that cage must add up to 9. A rule of 12x means the squares in that cage must multiply together to equal 12. A rule of 1- means the two squares in that cage must subtract (in any order) to equal 1. A rule of 2÷ means the two squares must divide evenly (in any order) to equal 2. A rule of 3= means that is a single-square cage whose value must be 3. A rule of Even means that all squares in this cage must have odd values (2, 4, 6, or 8). A rule of Odd means that all squares in this cage must have odd values (1, 3, 5, 7, or 9). A rule of Straight means that all squares in this cage must form a "straight" (like poker), IN ANY ORDER (for example: 4,3,5). A rule of <,> (or the "comparison" rule) means that all squares in this cage show greater-than/less-than signs to indicate their size relative to each other. Note that all cage rules - especially Subtraction, Division, and Straight - can function in any order. At the bottom of each square are the possible Candidate numbers for that square. To enter a number into a square, left-click on a Candidate or press a number key. To eliminate a Candidate, right-click it to toggle it as "impossible". On larger puzzles, this is VERY USEFUL. Some puzzles are Double Board puzzles; for these puzzles, both boards have the same answers, and you solve them both simultaneously! Other puzzles have Hidden Cages; you have to discern where the cages must go and paint in their colors as you solve the puzzle. Our favorite mode! SquareLogic has all kinds of neat stuff, so give the Free Demo a spin and try it out! 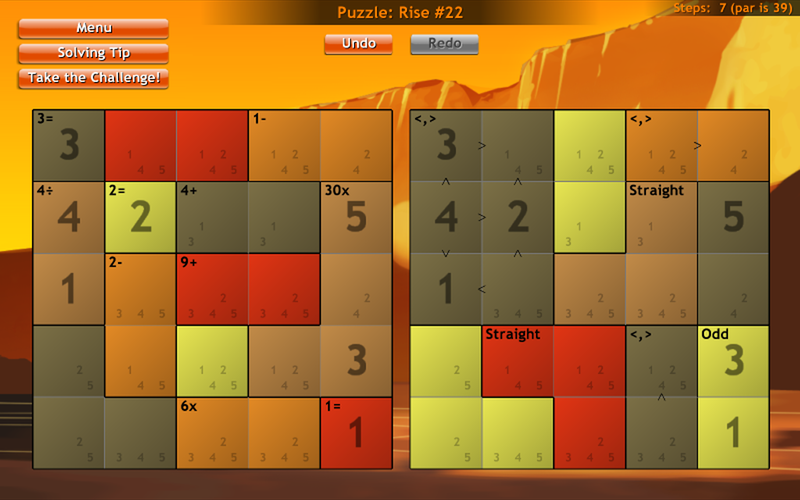 6 different puzzle sizes, from 4x4 up to and including 9x9! Each puzzle is guaranteed to be solvable, and have only one possible solution! Each puzzle is guaranteed to be solvable WITHOUT GUESSING! Automatic remote storage of your saved game, so you can play at work AND home and never lose your progress! A surprise - everybody loves surprises! A tutorial is available in-game that explains the basics of how to play. If you choose not to do the tutorial (we recommend that you do), the instructor will provide dialogs to teach you new rules as you go. 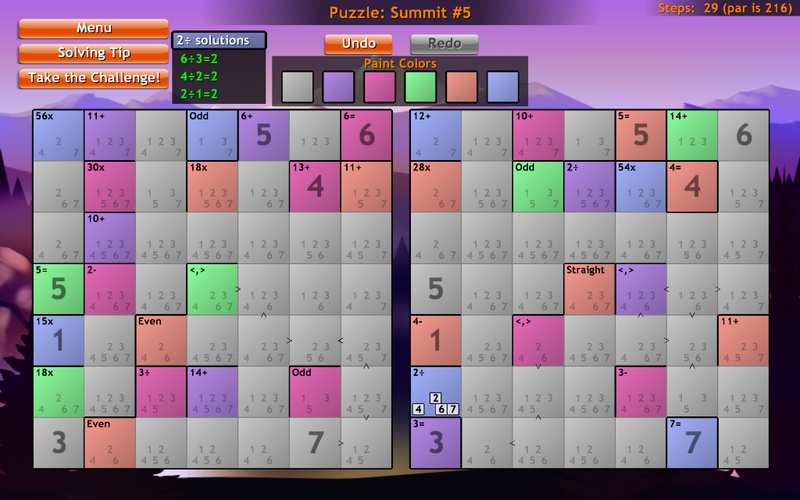 Be sure to use the Solving Tip button within the game if you get stuck or confused on any puzzle. Solving Tips never come right out and tell you the answer; they give you suggestions on which areas of the puzzle to consider, and will get more specific each time you press the button consecutively. Right-click on a candidate to mark it as being IMPOSSIBLE; with larger and more difficult boards, this is the most important move you make. Click the "X" in the upper-right corner of a square to clear its value. *Well, not in any legal sense do we promise. But we dig it. And we think you will, too.